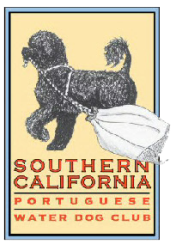 If you are considering a Portuguese Water Dog as a life companion, the best resource for everything you want or need to know about the breed is the national Portuguese Water Dog Club of America website. You will find a wealth of information that will help you determine if a Portuguese Water Dog is the right breed for you and your family, and how this breed will, or will not, fit into your lifestyle. The PWDCA web site offers breed specific information on training, grooming , kids and PWDs, mouthiness, the shedding myth, common diseases of the breed, what to expect from a breeder, contracts, the health and litter database and more. It is a great tool for current owners and potential owners alike.